Feed Your People Pop-Up: Llano Seco Porchetta! A seated dinner. Guests are welcome to BYOB wine and beer; we will also have bottles for sale. As we gear up to release our cookbook, Feed Your People, this winter, we invite you to join us for a dinner so delicious, just the name of the dish gets carnivores' salivating. A classic porchetta is made using most of a pig, which is deboned, seasoned, rolled, tied, and roasted outdoors on a spit for hours. Numerous regions of Italy claim the porchetta as their own, and throughout the year, special festivals (sagre) are held in its honor that bring together locals and tourists alike to feast on the succulent pork and the local wine at long communal tables set up in the town square. This pop-up will feature a porchetta recipe created by chefs Andrew Dovel with Gayle Pirie of Foreign Cinema restaurant in San Francisco’s Mission District. 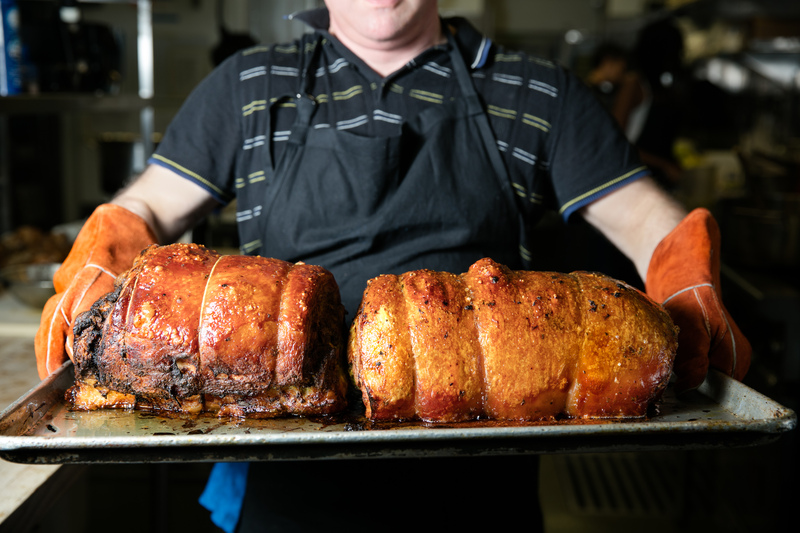 This recipe respects the grand scale of Italian porchetta and mirrors the generosity of Gayle and her husband, John Clarke, who have been chefs and co-owners of Foreign Cinema for over twenty years. Feed Your People features this recipe and more, created by some of our favorite chefs, representing foods they love to gather around. 18 Reasons' own Chef Mike Weller will take on Andrew and Gayle's recipe in our kitchen. Join us for a fun, relaxed evening, featuring the generosity of Llano Seco's bounty! Feed Your People is a community-based cookbook created by local author Leslie Jonath, with recipes for crowd-pleasing, big batch cooking from warm-hearted cooks, chefs, and grandmas for the foods we gather around--from backyard barbecues and soup suppers, to hand-wrapped tamales, dumpling dinners, and seafood boils. Whether for a family reunion, a DIY wedding, holidays, memorials, non-profit fundraisers or a neighborhood block party, this book will inspire you and make cooking for your community a delicious, affordable, fun, memorable feast. Feed Your People will be published this winter by Powerhouse Books. Click here to learn more.